I would like to briefly mention that Carmageddon: Crashers is currently a soft-launch title. Due to its unavailability in my region, I have sideloaded the APK in order to test the gameplay. There may be a few more adjustments to the game before it officially launches, so please take that into consideration when reading this hands-on. I suppose the best place to start is with the gameplay. As I mentioned above the fold, Carmageddon: Crashers utilizes the same mechanic found in CSR Racing. Essentially you time your gear shifts in such a manner that you speed up at particular shift points, or you slow down due to not timing your shift correctly. Whether you are playing against the computer or a live opponent, timing each shift correctly is your primary goal. But where Carmageddon: Crashers differs is in its presentation. Instead of racing side by side against your opponent, you are racing towards them. Whoever is the higher level and does not miss any of their gear shift points will win the match by way of viewing a bone-crushing crash. Something that brings me to the other main mechanic in this game. You will be spending quite a lot of time purchasing upgrades for your car. These upgrades consist of Karma, Power, Armor, and Handling. As you win your races, you will earn in-game cash. This cash is then spent on those four upgrades as well as on other vehicles to race with. Of course, once you are past the first hour or two of gameplay, you will be earning your cash at an increasingly slower and slower pace. Par for the course for a free-to-play game. Moving along, I would like to cover how Carmageddon: Crashers is monetized. Since this is a FTP release, it is pretty safe to assume the worst. That means you can expect two kinds of currency, loot crates, and a quickly depleted energy system. While you can earn both currencies of Cash and Gold through gameplay, you will eventually hit a point where it is too difficult to secure on your own for any semblance of relatively paced progression. The loot crates, on the other hand, are not quite what I expected. Instead of randomizing what you get with a crate, they are simply a package of Cash and Gold available for one price. A convenience tool for those that spend money on the game. Of course, the last thing to consider is the game's energy system. I have run through my energy in under half an hour of simply playing one race after another. It depletes quickly, and the only way to get more energy is to either wait the many hours until it refills on its own, or spend Gold, the most difficult currency to earn for free. All in all, the monetization for Carmageddon: Crashers is abysmal. Once you see the awkwardly high pricing of the in-app purchases, you will wonder who would ever drop $164.47 on a cloned drag racing mobile game. So sure, Carmageddon: Crashers takes some very tried and true gameplay and tweaks it into something more fitting of the Carmageddon franchise. But is it really enough to warrant the numerous highly priced IAPs? In my opinion, I say no. While it can be fun for a minute or two to smash your car at high speeds into another, this gameplay wears thin relatively quickly. 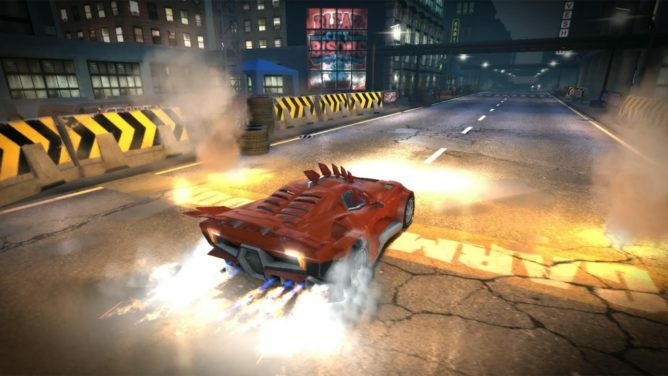 Considering that you will eventually hit a wall in what you can do without having to grind endlessly, Carmageddon: Crashers is simply more of the same uninspired tat that makes its way onto the Play Store every single day.